The brand new BabySPA by Baby Diego is by far the ideal way of bathing and changing your baby. BABY SPA offers you the comfort and practicality of bathing your baby at WAIST LEVEL. No more bending to bathe your baby in the tub. No more taking your baby into the kitchen sink. Pamper your baby & yourself (specially your back!) with BabySPA and turn the bathing experience into one you really look forward to everyday. HOW IT WORKS: Place the BabySPA in the most convenient location to bathe your baby. A long drain tube allows the bath to be easily drained without having to lift the bath when it is full of water. 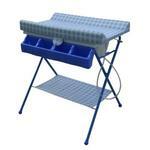 Simply push the top (changing table) back exposing the bathing tray to bathe your baby. After baby.s bath, lift baby out of the bathing tray and move the top back over the tub, giving you a firm drying and dressing table to get baby dressed. Keep towels, soap, shampoo, diapers, toys and all other supplies neatly organized and within easy reach in the caddy compartments or lower storage space below the bath. 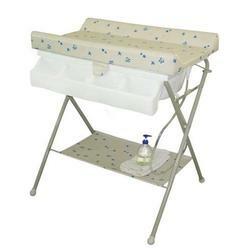 BabySPA by Baby Diego is designed with 2 positions to allow an infant to lie down or a toddler to sit up while bathing. The changing pad includes a safety strap and is made of soft non-toxic cushioned vinyl. The entire product can be easily cleaned with soap and water. The stylish foldable stand allows for it to be easily stored after use if needed. PBA Free, Phthalate Free, Lead Free. Best value in the market! Place BABY SPA in the most convenient location to bathe your baby - in or next to the tub, in the kitchen, or virtually anywhere. Simply push the top (changing table) back exposing the bathtub to bathe your baby. 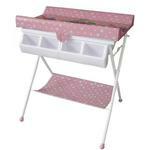 After babys bath, lift baby out of the bathtub and move the top back over the tub, so you have a firm drying & changing table to get baby dressed. BABY SPA - by BabyDiego is designed with 2 positions to allow an infant to lie down or a toddler to sit up while bathing. You can safely use Baby SPA with babies 0-24 months that don’t exceed 30lbs.